Home / Diamond Search / SelectLooking for Fancy Color Diamonds? Brian Gavin Signature Diamonds are the pinnacle of diamond cut quality, and exceed the quality required to obtain an overall cut grade of AGS Ideal-0 from the American Gem Society Laboratory. Our Signature round and cushion cut diamonds exhibit a stunning pattern of hearts and arrows, which results from consistency of facet shape and alignment, as well as extremely precise 360° alignment of the facets. This superior level of optical symmetry results in a higher volume of light return, brighter looking diamonds, and a higher degree of brilliance, dispersion, and scintillation than provided by standard ideal cut diamonds. The diamonds featured in the Brian Gavin Blue collection of diamonds with blue fluorescence, exhibit a high degree of optical symmetry, and have been graded as AGS Ideal for Light Performance by the American Gem Society Laboratory. These diamonds exhibit medium blue, strong blue and very strong blue fluorescence, which can boost the body color of a diamond. Combined with zero ideal cut proportions and superior diamond cut quality, blue fluorescence can help a diamond face up brighter and whiter than a diamond without fluorescence. Every diamond is personally evaluated by Brian Gavin to ensure that the blue fluorescence is having a positive effect. Ushering in a new standard in the light performance of diamonds, Brian Gavin Diamonds has unveiled its newest and most extraordinary diamond collection, Black by Brian Gavin®. The collection only features diamonds containing “Gavin Effect®”, D through G colors, and IF though VS2 clarities. All diamonds in the collection also feature Brian Gavin’s Signature Hearts and Arrows pattern to ensure the diamond embodies the perfect marriage of sparkle, brilliance, fire and scintillation. Each Black by Brian Gavin diamond undergoes a detailed inspection and is affirmed with an exclusive Black by Brian Gavin branded AGS Lab grading report. 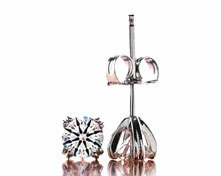 The diamonds featured in this category represent a broader range of diamond cut quality and proportions. 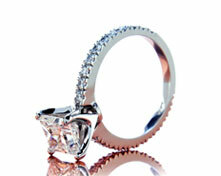 It provides our customers with access to diamond options which are economical and which meet practically any budget. Diamond clarity and reflector scope images are not provided for these diamonds because they are not in-house.